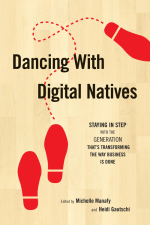 Dancing With Digital Natives, Edited by Michelle Manafy and Heidi Gautschi | Information Today, Inc.
"This remarkable group of editors and authors presents a range of opinions about the challenges and opportunities of business life in a digital era. Taken together, these essays help us to debunk many of the myths that we too commonly rely upon when we talk of digital natives, in the context of business, marketing, learning, career development, and otherwise. … No matter what, this book will make you think." "The wide array of fresh insights offered [here] gives educators, employers and marketers the techniques and tools to better understand this challenging generation." "Blends the practical with the profound on how to make the most of this promising population of young people. It's all you'll need." Listen to Michelle Manafy talk about her book, Dancing With Digital Natives, on Brainstormin' hosted by Bill Frank.